OK, so this is a little off topic for me but I couldn’t resist. It may not be interactive but hopefully it will still be informative and helpful enough to assist everybody struggling to understand the complicated issues behind the Alternative Vote referendum to be held on the 5th of August. So on the 5th of September if you are still struggling to make up your mind than please feel free to print this out and take it with you. Good Luck and I hope your side wins! 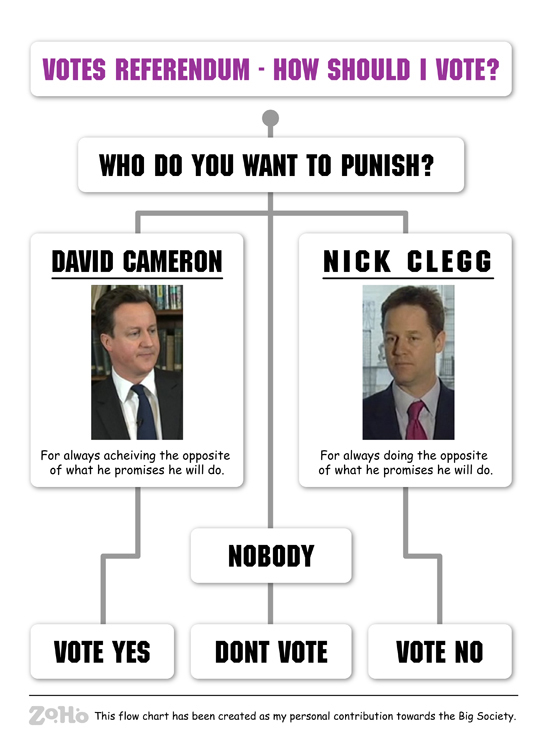 This entry was posted in Data Visualisation, Fun Stuff and tagged Alternative Vote referendum, AV, Flow Chart. Bookmark the permalink. Post a comment or leave a trackback: Trackback URL.